Firefighters are damping down after a blaze broke out in a flat in Sheffield this morning. Crews were called to St Lawrence Glebe, off St Lawrence Road, Tinsley, at 10.55am and found a second floor flat alight. A Sheffield Council worker spotted smoke and raised the alarm. He alerted residents in the block to the fire but residents fear a neighbour perished in the blaze. 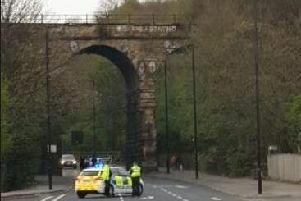 Details have not yet been confirmed by South Yorkshire Police or South Yorkshire Fire and Rescue. Emergency services remain at the scene of the blaze, where a tent has been erected outside. Detectives and police scenes of crime investigators are also at the flat. South Yorkshire Fire and Rescue said a ‘multi-agency investigation into the cause of the fire will take place once the fire is completely out’.